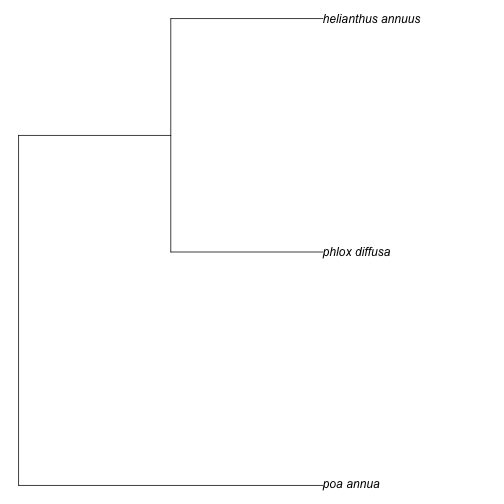 Includes methods for fetching 'phylogenies' from a variety of sources, including the 'Phylomatic' web service (< http://phylodiversity.net/phylomatic>), and 'Phylocom' (< https://github.com/phylocom/phylocom/>). 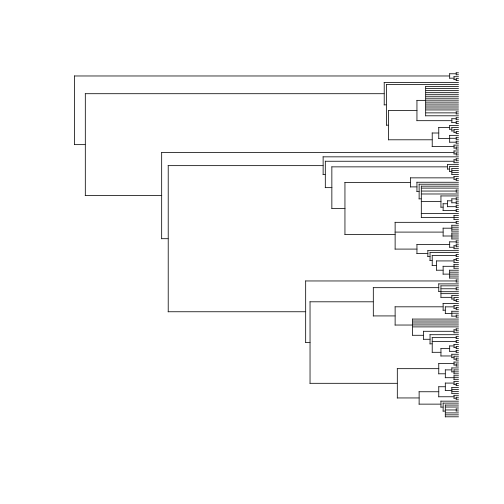 Brranching is an interface to many different sources of phylogenetic data (currently only from Phylomatic (http://phylodiversity.net/phylomatic/), but more sources to come) that allows users to query for phylogenetic data using taxonomic names. For brranching::phylomatic_names() function you should get an NCBI Entrez API key. NCBI Entrez doesn't require that you use an API key, but you get higher rate limit with a key, from 3 to 10 requests per second, so do get one. Run taxize::use_entrez() or see https://ncbiinsights.ncbi.nlm.nih.gov/2017/11/02/new-api-keys-for-the-e-utilities/ for instructions. You can pass in up to about 5000 names. We can use taxize to get a random set of plant species names.